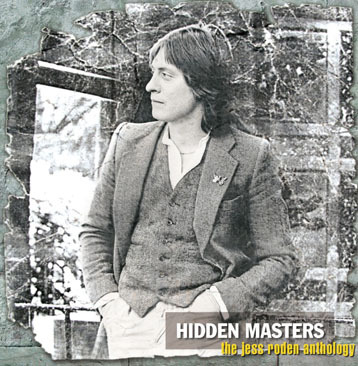 Hidden Masters is proud to announce the discovery of exactly that; the long-thought-lost analog tapes that comprise Jess Roden's entire musical career that, itself, spans 3+ decades. All have been newly digitised – the vast majority for the first time ever; a vital process that has ensured Jess' music has now been properly preserved for all time. Indeed, due to their age, many of the analog tapes were deteriorating so badly, they had to be oven-baked for days to preserve the tape-oxide prior to running them through original 1/4", 1" and 2" tape machines. The entire process has taken over two and a half years from inception to now – a project that began when Jess wondered out loud one evening during the Summer of 2009 "I wonder what really has survived? With all my bands, we recorded so much and yet you hear stories the whole time of multitracks ending up in skips and just being generally thrown out. It'd be nice to know if anything was sitting in an archive somewhere." Intense research ended up as a series of spreadsheets that contained well over 800 pieces of music – and that was just from the information written by studio technicians on tape boxes long-ago.  The digitisation process – all undertaken under the watchful eye of Richard Whittaker at FX, bore further relevations... some of the tape-boxes had been wrongly marked up meaning that we also found songs that Jess could barely remember writing let alone recording. All of the 1/4" and 1" tapes were transfered straight – Jess' watchword being "These are all of a time and they must remain of that time." Any required 2" multitracks (when a song we wanted to include only existed in that format) were monitor mixed with Jess not just having the final word on the mix but occupying the producers chair in the studio. The final selection took months of reflection and consideration. Decisions were made and then changed – more than a few times. Nonetheless, we remained true to Jess' initial premise of "There was a reason why some of this did get left on a shelf – but, IF it stands up now in the listening... or, if its better than the version that was released... then lets go with it". The end result? We set out to compile a definitive Anthology and... we believe we've done just that.